Robert Rauschenberg's The 1/4 Mile or 2 Furlong Piece roughly spanned the length of his commute. It is now on view at the Los Angeles County Museum of Art — exhibited in its entirety for the first time. Painter Robert Rauschenberg really loved his job. "My greatest joy is in working," he told PBS in 1998. "That's when I feel a wholeness and a celebration of a unity with everything about me." So when Rauschenberg walked the quarter mile from his house to his studio in Captiva, Fla., that short commute was a journey toward joy. "He talked a lot about working in that fertile, creative space between art and life," says Katia Zavistovski, an assistant curator at Los Angeles County Museum of Art. 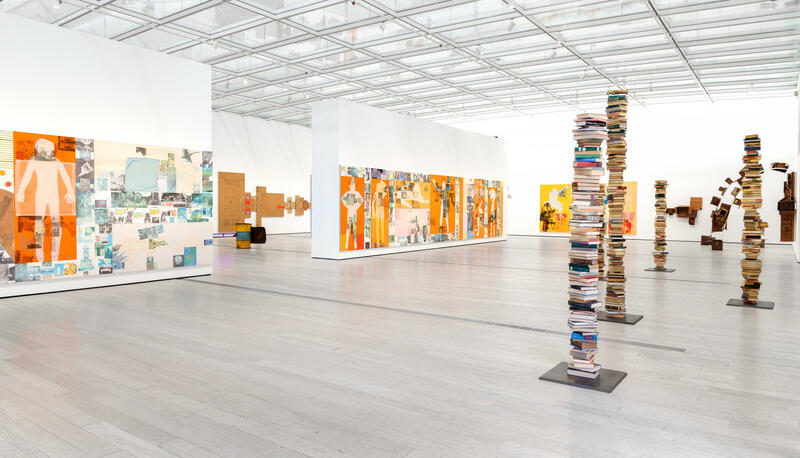 On view at LACMA now — exhibited for the first time in its entirety — is a massive Rauschenberg work which approximately spans the length of his commute. The 1/4 Mile or 2 Furlong Piece is comprised of 190 mixed media panels, sounds and sculptures. Rauschenberg worked on it on-and-off for 17 years, from 1981 to 1998. It's a memoir, says LACMA director Michael Govan — a walk through the artist's life. The panels are painted and collaged with photographs and fabrics. There are checkered tablecloths and flattened T-shirts — all things that meant something to Rauschenberg. Panel 1 is full of familiar objects: magazine and newspaper images of rocket ships, flowers, money, and — of course, the start to any good work day — a cup of coffee. He used lots of found objects — a rusted wheelbarrow, a beat-up chair, cardboard boxes. Cardboard boxes spring off the wall in Rauschenberg's The 1/4 Mile. "The bric-a-brac of the leftover is the magic of his art," Govan says. "Because you have to think of art — it's always the transformation of nothing to something." By the time he died in 2008, Rauschenberg had traveled around the world, tape recorder in tow. Sounds he recorded are incorporated into this artwork — a baby crying, elevator doors, a band saw. The panels are fun, though Rauschenberg shows his worries, too — there are references to environmental damage, repression and war. But you can see that it's joy that drives him. His self-portrait is collaged with images of things he loved — you'll find baby shoes, avocados, a newborn duck and a piece of bread. As a young man in the 1950s Rauschenberg was bothered by the prevailing idea — the hotshot abstract expressionist idea — that it took suffering and pain to produce important art. "He is prolific in a joyful way," Govan says. "Looking at everything in the world — a piece of trash, an odd juxtaposition of objects — and in it he finds life." 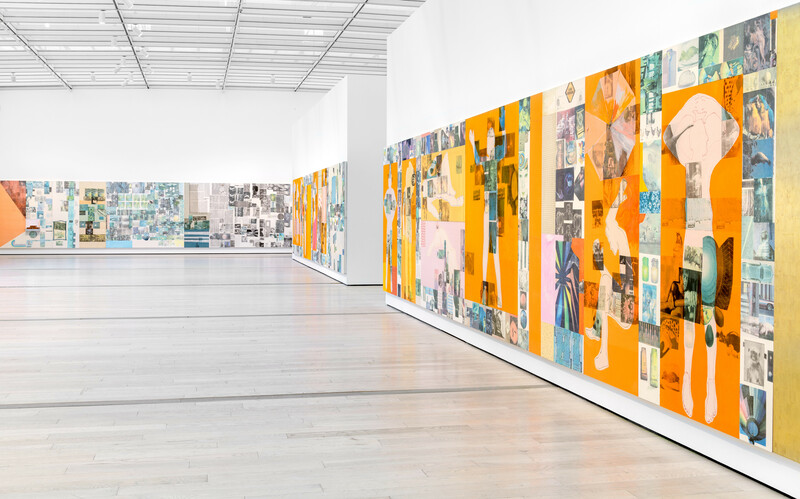 With a quarter mile of panels occupying nearly an entire floor of LACMA through early June, visitors will have the opportunity to go for a walk and enjoy life through Rauschenberg's eyes. Rauschenberg worked on The 1/4 Mile on-and-off for 17 years, from 1981 to 1998. The LACMA exhibition was curated by Katia Zavistovski and Michael Govan. Painter Robert Rauschenberg once measured the distance from his house to his studio in Captiva, Fla., and then he made an artwork that is as long as his measurements. He called it "The 1/4 Mile" or "2 Furlong Piece," 1981 to 1998. It is an enormous series of panels. NPR special correspondent Susan Stamberg just walked through the work at the Los Angeles County Museum of Art. She wore some comfy shoes. SUSAN STAMBERG, BYLINE: Here's something nice Robert Rauschenberg once said on PBS. ROBERT RAUSCHENBERG: My greatest joy is in working. That's when I feel a wholeness and a celebration of a unity with everything around me. STAMBERG: So that quarter-mile walk from house to studio was a commute toward joy. KATIA ZAVISTOVSKI: He talked a lot about working in that fertile, creative space between art and life. STAMBERG: Katia Zavistovski co-curated the exhibit with LACMA director Michael Govan. It was Govan's dream to show all 190 panels. The dream's come true for the first time ever. MICHAEL GOVAN: You can't remember it, and you can't see it in reproduction. STAMBERG: It's a memoir, Govan says, a walk through the artist's life. Panels painted and collaged with photos, fabrics, checkered tablecloths you'd see at some red-sauce Italian restaurant, even T-shirts flattened for paint - stuff that meant something to Rauschenberg. It's very personal. But how does it mean anything to the rest of us? GOVAN: It means everything to the rest of us. STAMBERG: Panel 1 is full of things we know - magazine and newspaper images of rocket ships, flowers, money, a cup of coffee. GOVAN: You start your day with a cup of coffee. And here, this beautiful 17 (laughter) years of work starts with a cup of coffee. STAMBERG: He used lots of found objects - a rusted wheelbarrow, a beat-up chair, cardboard boxes. GOVAN: The bric-a-brac of the leftover is the magic of his art because you have to think of art always of - it's always a transformation of nothing to something. STAMBERG: By the time he died in 2008, Rauschenberg had traveled around the world and took a tape recorder with him. Sounds he recorded are part of this artwork - a baby crying, elevator doors, a band saw. It's pretty quiet, though, at Panels 69 through 73 - a sculpture, sort of. Five high stacks of books, Florida Public Library discards, piled one on top of the other. ZAVISTOVSKI: I love those books - fiction and science and math books. GOVAN: They have a pole inside them, so they look like a huge, tall stack, taller than we are - much taller, like totems. STAMBERG: Must have been fun piling up books. There's fun on lots of the panels, although Rauschenberg does show his worries, too - environmental damage, repression, war. But you can see that it's joy that drives him. His self-portrait here is collaged with images of things he loved - baby shoes, avocados, a newborn duck, a piece of bread. So you look at it. He says it's a self-portrait. You think, who is this guy? Who is this guy? GOVAN: He's prolific in a joyful way, looking at everything in the world - a piece of trash, an odd juxtaposition of objects - and in it, he finds life. STAMBERG: As a young man in the 1950s, Robert Rauschenberg was bothered by the prevailing idea, the hotshot abstract expressionist idea, that it took suffering and pain to produce important art. Rauschenberg disagreed. And with his life-affirming work, LACMA director Michael Govan says he made his mark. GOVAN: For me, Rauschenberg is one of the most important artists of the century. STAMBERG: The last century. And with his quarter-mile panels occupying nearly an entire floor of LACMA through early June, he strides into this century too. In Los Angeles, I'm Susan Stamberg. Transcript provided by NPR, Copyright NPR.